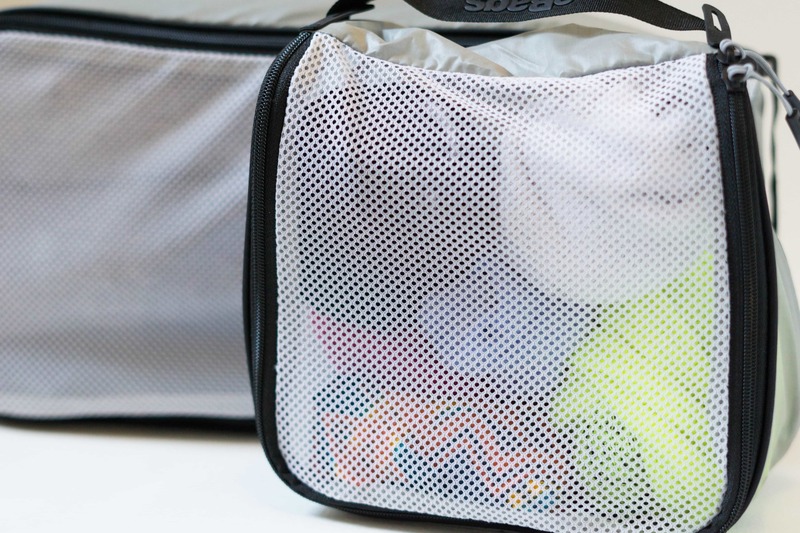 The Ultralight Packing Cubes from eBags offer organization for any backpack or luggage you choose, and they have a few features that set them apart from the competition. The 8oz measurement refers to a full set of two small, one slim and two large cubes. Regardless of what type of bag or luggage you choose to carry, the contents should be organized. When everything has a home, peace ensues and things are right in the world. We like it when that happens. Packing cubes are an essential tool for any nomad. And while we love surprises as much as the next person, sitting in the middle of a terminal, rifling through your luggage to grab a fresh pair of socks at the bottom of your bag isn’t the most glamorous display. Packing cubes can alleviate the adventure (and hassle) of the un-pack, re-pack routine of travel. 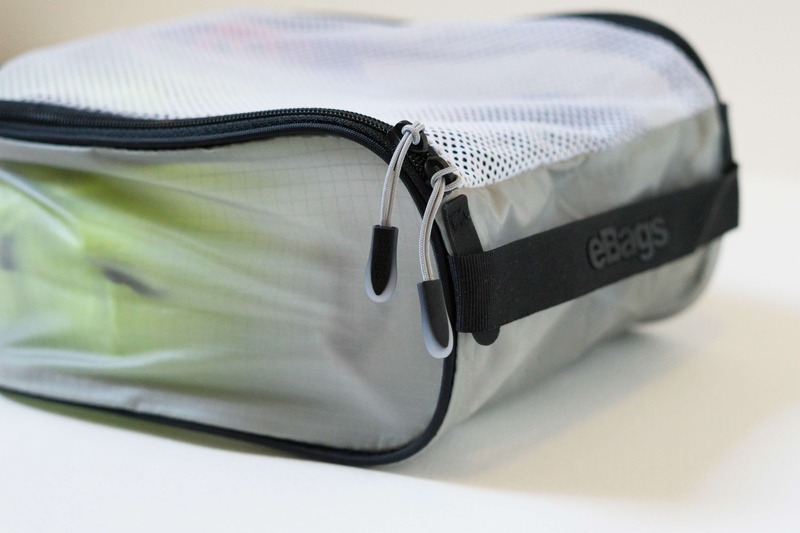 The folks over at eBags have done a great job with their Ultralight Packing Cubes, which can handle any organizational needs you may encounter during your packing and un-packing. So far, we are big fans. Why are we big fans, exactly? Well, there’s a slightly ridiculous number of packing cube styles available, but there are a few things that give these ultralight packing cubes a leg up. One feature that allows these packing cubes to stand out from the rest is the spring-loaded frame design, which enables the bag to retain an upright shape while you pack. Other types of bags often lie flat and you fill them up as you go. These cubes, on the other hand, have a flexible, thin wire frame which makes it that much easier to achieve maximum organization with your packing routine. No fussing around trying to properly organize every crevice that you can’t see, instead the whole compartment is upright and accessible. Although it’s great to give the cubes a little structure, the wire can feel a tad “flimsy” at times. Another feature that we’ve been liking on these cubes is the mesh lid. When you’re trying to find garments quickly, being able to see the contents of the cube is invaluable. What’s the point of all this organization if you have to open every compartment and unpack to realize you grabbed the wrong cube? Now you have to play packing cube roulette—a game that no one should play. 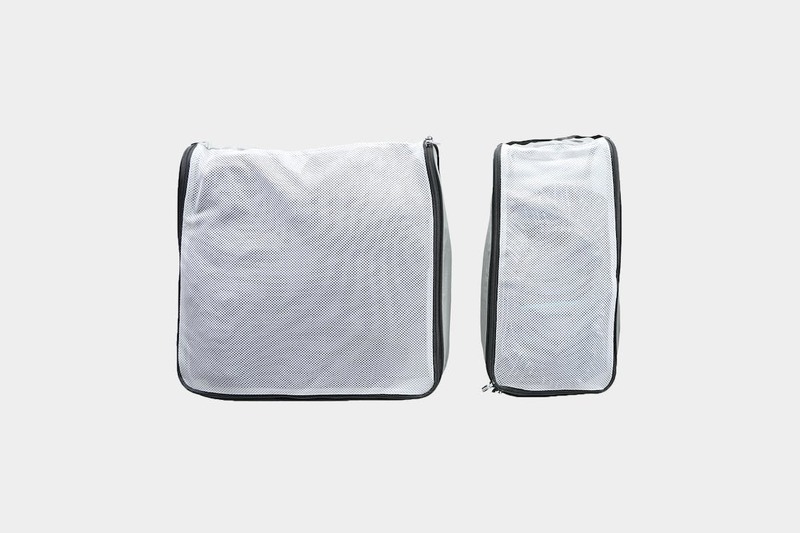 A solid mesh panel is key, and we are fans of the flexibility and stability of the mesh on the eBags cube. Eagle Creek tries to implement a faux-see-through technology with their Pack-It Specter Cubes (which we REALLY dig), but it’s just not as easy to see as mesh. Props to eBags here. That being said, we do have one gripe here. 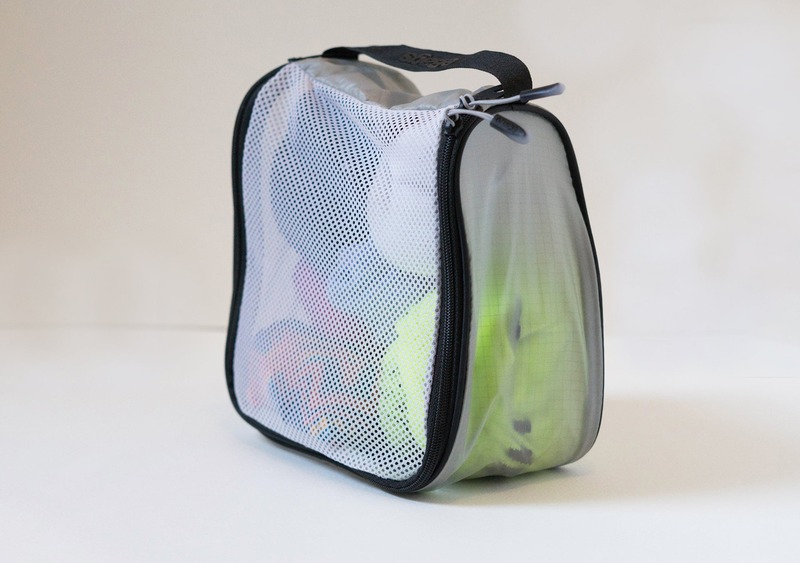 While the mesh feature adds some nice breathability, we wish there was a “laundry” style bag with no mesh, which would keep your used and unused clothes separate as well as contain any odors from dirty garments. The last thing you want is for that sandy, wet swimsuit to cross-contaminate with your fresh dinner outfit. Yuck. The core fabric for these cubes is 30D CORDURA® brand nylon. This fabric is specially coated with silicone on the inside to provide a smooth and slick packing surface. Alternatively, eBags has chosen a polyurethane exterior coating to prevent the bags from slipping around inside of your luggage. This is a great feature that shows the design team at eBags has put a lot of thought into these little cubes. There are some classic, trusty YKK zippers on these things, with matching-color zipper pulls. At the end of each zipper pull is a synthetic rubber tab (the exact material is Hypalon, if you’re curious). This thin rubber allows you to open and close the zipper without putting too much stress on the bag, or the zipper itself. While we found all the materials to be generally sturdy, this small touch ensures that the seams and zippers will gain extended life as a result of the reduced tugging and pulling on the fabric itself. 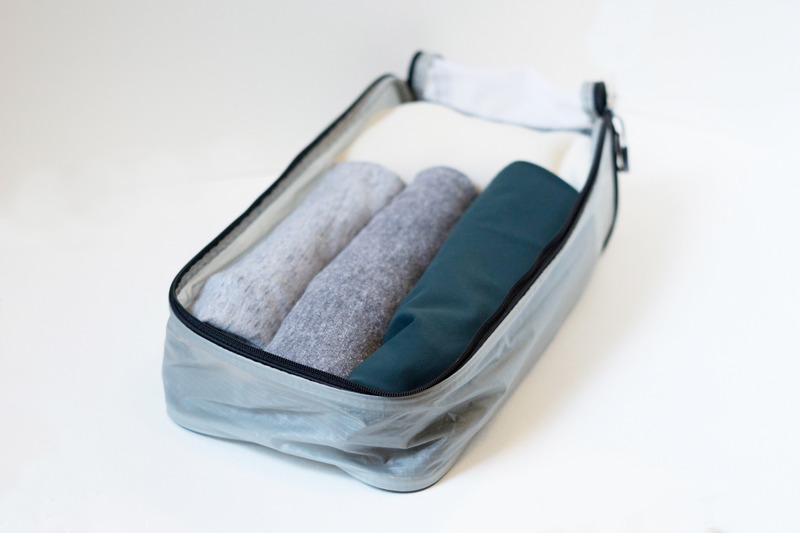 These packing cubes come in a variety of sizes and colors, which is always nice. At the time of this review, there are a handful of sets to choose from—3, 4, 5 and 7 piece sets. You can also buy them individually if you’d like to add to your current packing cube inventory or make a unique set for yourself. For sizing, you have the option of large (13x13x3.5in,) slim (13×6.5×3.5in) or small (6.5×6.5×3.5in) sizes. The large size seems perfect for bulkier items, or something you wouldn’t want to cramp into a small fold, like a dress shirt. For the slim, we found that anything you might condense in a fold or roll up tends to fit perfectly. Wrinkle resistant stuff works well here. The small size is perfect for undergarments and socks. You also get a few color variations to choose from, the selection at the time of this review includes sets in blue, black, green or grey. While you may not need to buy all the color sets for yourself, if you are traveling with a partner or want extra organization we recommend grabbing sets in different colors. That way, you can do some swapping and give each other the opportunity to organize your gear by color. ie; socks in the green bag, underwear in the blue bag, etc. Clean, all elements in great condition. Still working out well after being tested on an average of 2 flights per week. Sturdy mesh makes it easy to see the contents. Wired frame gives a little structure when packing the cubes. Zipper tabs are easy to grab, but don't get in the way. Slight "flimsy" feel with the wire. Durability concerns with the small zippers. When it comes to the Ultralight Packing Cubes, organization is effortless with a variety of color and size options to boot. Not all packing cubes are created equal, and the details put into this set is no exception. From the view of quality, structure and functionality, eBags has done a great job with their Ultralight Packing Cubes. We just wish the zippers were a little larger for added durability and it felt a little less “flimsy” with the wire!